The Speedway Club is committed to making your event a memorable one. We are located in one of the most excitingly unique venues, Charlotte Motor Speedway. We occupy the 5th and 6th levels of Smith Tower and our spectacular restaurant overlooks the front stretch of the speedway. Our in-house event planners offer an unmatched level of service. Detailed and thoughtful planning goes into every event, all with the goal of excellence in execution. Our flexible event spaces can accommodate any size event. All rooms are equipped with Wi-Fi access and comprehensive audio/visual equipment is available. Other amenities include complimentary on-site parking, a dedicated staff and catering team, audio/visual equipment, complimentary Wi-Fi, and unique views from every event space. Call us today to speak with our event planners or to set up a tour of this amazing facility! The 5th floor's Clubhouse area features 2 onyx bars and a panoramic view of Charlotte Motor Speedway. 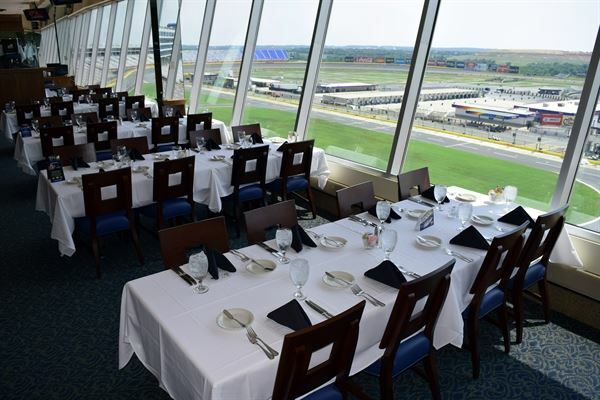 Overlooking the 1.5-mile superspeedway, The Speedway Club Restaurant can accommodate up to 200 people for your special event, has a permanent dance floor and full-service bar.